Remember the melting ice cube experiment? Great! 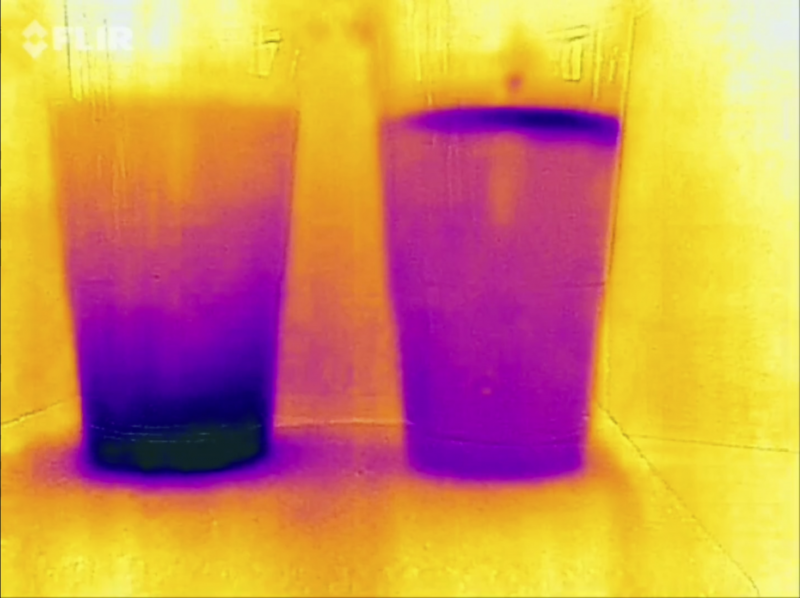 If I had the chance to teach an intro to oceanography or some other class where I have time with students over a longer period (these days I am mostly giving one-off workshops), I would actually use the thermal imaging camera to make a different point with this experiment than the one I have usually recommended it for. I would first do the classical experiment to talk about density-driven circulation. This could be done either using dye (levels of difficulty would be something like 1) easy: freeze dye into the ice cube. 2) medium: let them observe what happens with clear ice cubes and only add dye once they’ve realized that the fresh water ice cube is melting much faster, but have a hard time figuring out why. In this case, drop dye onto the melting ice cubes. 3) no dye at all, but let people focus on condensation pattern on the cups as well as shapes of the ice cubes. I tried that for the first time a couple of weeks ago and it worked really really well. I think that’s my favourite way of doing the experiment now! After students have done that experiment and we have moved on to properties of seawater etc weeks later, I would bring the same experiment back when talking about how water is transparent to visible light, but not to all other wavelengths. 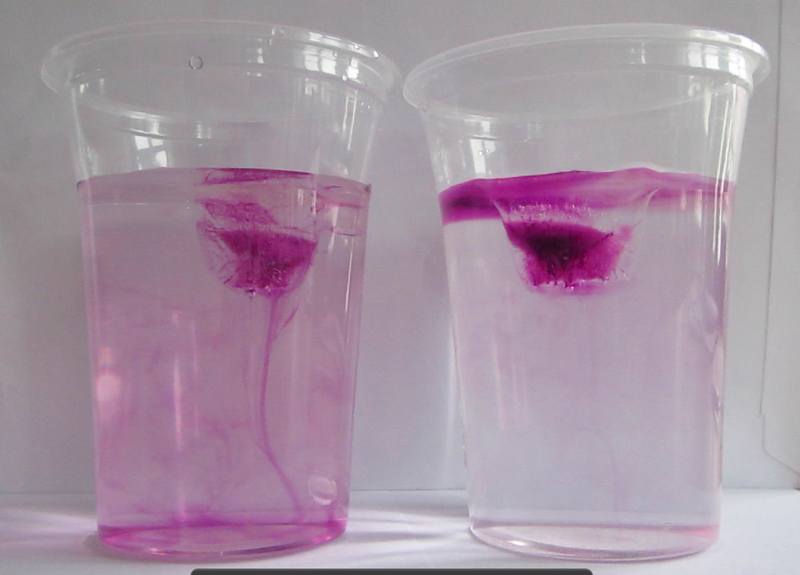 Because students will likely assume that they will see the same kind of pattern that they saw with dye (or that they sketched when they drew the mechanism), but actually, unless the plume of dense water is flowing right along the edge of the cup, they won’t be able to see it because they really only see the temperature of the cup itself and can’t “look inside” the way they can with their eyes. So at first, I would assume, they’d be a bit bored and annoyed to be presented with the same experiment again, until they realize that now the point is a very different one. (Since I haven’t tried to use that experiment in that way, I am not quite sure how it will work, I think it would be important to either hold the melting ice cubes in the middle of the beaker. That way, there is no cold plume along the edge of the cup, and students see cold water appearing at the bottom of the cup “out of nowhere”. Alternatively, one could ask them to look at the cup from the side opposite to where the ice cube is (they always float to the edge somehow), but maybe that would be giving too much away already?). So now the point would be to explain why we can’t see the sinking plume on the thermal imaging camera, and dependency of transparency of sea water on wavelengths of light. This can lead to ocean color, remote sensing, camouflage colors of animals, all kinds of other stuff. I think that could actually be exciting! What do you think?